In February 2011, IBM proved that computers can also recognize patterns, by demonstrating the Watson Supercomputer, which recognizes patterns in text data to surpass the capabilities of the human mind. For behavior pattern recognition, Israeli security systems evaluate a series of events to reach a conclusion. Their airport screening supervisors have a score sheet with a list of behaviors on it. Are they merely loitering in the area? Are they wearing a warm coat on a hot day? Are they sweating or nervous when they come to the airport security checkpoint? Do they make hand signals to colleagues? When a list of specified behaviors hit a certain number, the system recognizes a potential threat. Similar “behavior pattern recognition” is applied in the financial world. Bank computers evaluate a progression of transactions to trigger an alarm concerning a suspicious, or fraudulent event. A sequence of activities become a recognized pattern, with a single name - fraud. The human mind recognizes patterns on a massive scale. Science has discovered the logic behind some pattern recognition functions of the mind. In 2004, a Nobel Prize acknowledged the discovery that the mind uses a combinatorial coding. The nervous system uses dynamic time dimensioned recognition.The human mind deals comfortably with sequences of millions of neural matrices in events. 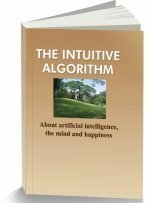 Intuition enables recognition of the event by identifying any unique quality of any of these matrices. Varying combinations of words describe the world and its environment. Recognition handles rising hierarchies of meaning. Combinatorial coding enables a virtually infinite memory storage capacity. Computer simulation of the mind will require the simultaneous recognition of multiple events. In 2004, a Nobel Prize acknowledged the discovery that the mind uses a combinatorial coding process in the neural matrix to recognize patterns. The researchers used calcium imaging to identify individual mouse receptor neurons, which fired on recognition of specific odors. When the neurons were exposed to a range smells, they found that a single receptor could identify several odors. At the same time, each odor was identified by several receptors. Different combinations of receptors fired within the olfactory matrix. Recognition of those combinations enabled the mind to individually identify different odorant molecules. A similar matrix of chemoreceptors in the tongue identify molecules which carry information on taste. Other matrices of receptors are massed together to form sensory subsystems such as eyes and ears. This website suggests that the vast memories of neurons for the combinatorial codes of such neural matrices enable the mind to remember and recognize the complex patterns of the environment. 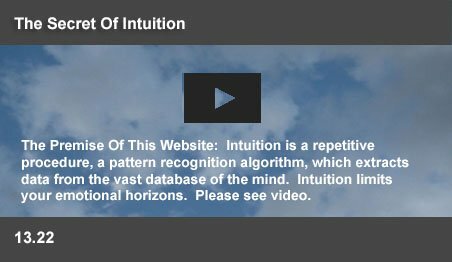 Intuition is an algorithm, which enables complex and intelligent interactions between functional networks in the nervous system. Intuition eliminates unrecognized combinations through inhibition. The nervous system manages dynamic recognition. The recognition of an odor identifies a single entity among millions. But, animals also use this ability for time dimensioned recognition. Dogs can quickly sniff a sequence of footprints of a person and determine accurately which way the person is walking. The animal's nose can detect the relative odor strength difference between footprints only a few feet apart, to determine the direction of a trail. The somesthetic association region of the brain enables you to recognize a pair of scissors, with your eyes closed. If this region is damaged, you will be able to feel the scissors, but you will not be able identify it. This recognition process is also dynamic. An instant touch cannot identify a pair of scissors. You have to run your fingers over it. A sequence of touches recognizes a single object. The human mind deals comfortably with sequences of millions of such matrices. People are reported to be able to remember and recognize any one of 10,000 images displayed to him at one second intervals. Each image is a matrix of millions of pixels. The mind has the ability to remember and recognize images in huge sequences of massive matrices. Combinatorial codes enable matrices to record, interact and recall the patterns of other matrices. This ability to identify the unique qualities of matrices over time enables behavior pattern recognition by the mind. That process can identify events the way a movie subtitle identifies a sequence of film images. If a recording iterates the subtitle across the length of an activity, then any individual frame of the movie will identify the action through the subtitle. In such matrices, an iterating pattern can recognize a sequential activity. The mind learns by paying attention, which sets the context. The system pays attention to an activity contextually learned as “Sit.” The system registers the “Sit” matrix against every frame of a sensory movie of a person sitting down. Subsequent recall of any frame of the movie would link to the “Sit” matrix. Like a strip of movie film, where the title is repeated, while the images change. Later, any frame of the movie can recall the related title. It symbolizes the act and enables recognition. Intuition is a process, which enables recognition of the title by identifying any unique quality of any of these matrices. The human mind records and recognizes events against millions of sensory contexts. Specific association regions of the brain are known to recognize such events. Understanding events is the essence of thinking. Behavior pattern recognition enables the mind to understands verbs. A running image is recognized by the event association region as "run". Running, sitting down, or walking are simple events, recognizable from a single symbol. Beginning from a set of primitive words, language expresses the vast knowledge of humanity in myriad combinations of words and sentences. Language is not onecontinuousexpressionoftheidea. The words need to be separated for understanding. There are sentences, paragraphs, chapters and books. The mind recognizes these symbols in time dimensioned packets. Each sentence has an acceptable length and every sentence closes with a period. Those symbols represent ever longer sequences of pattern recognition steps. A sentence is a behavior pattern. Each unique combination of distinct words have distinct contextual meanings. It contains data regarding objects, events and their static and dynamic relationships. It is recognized in sequential segments. Each word is separately recognized and, subsequently, the whole meaning of the sentence. Even the sequence is important. If it is changed, the meaning changes. “Jack killed Jacob.” is not the same as “Jacob killed Jack.” The subtleties of grammar change meaning too. Recognition of these combinatorial groups in the neural matrices occurs in finite time dimensioned sequential packets. The average sentence structure and length suggests a ten to fifteen seconds period for the absorption of an event by the mind. The mind also simultaneously recognizes multiple events. When you drive through traffic, you are separately aware of the movements of many objects in your field of vision. While attention focused on a single event, others are also recognized. Each event has a distinct context, history and future possibilities. Cars move in various lanes. People cross the road. Signals flash. You recognize where a pedestrian came from and where he is likely to go. Behavior pattern recognition implies a complex past, an active present and a pregnant future. A picture can represent many objects. The neural matrices of the mind can represent multiple events, just as a TV screen displays many simultaneous activities. The programming code is galactic in size and magnificent in its detailing complexity. The size and detail makes such pattern recognition possible for the human mind. Nature operates on a grand scale. The reported volume of the DNA code in your body is an indication of the sheer power of nature. At the moment of conception, the genetic DNA information in a single fertilized human egg occupies a thousand 500 page books. In a grown human body, the total of those codes will fill the Grand Canyon fifty times over with 500 page manuals! Similar memories are stored by the nervous system. The system can compare current recognition with the analysis of an image you saw twenty years ago. In addition, special purpose entities within the brain evaluate sensory inputs to recognize myriad patterns in the environment. There are systems, which define the edges, lines and movements of objects. Others recognize faces, hands and eyes. Mirror neurons recognize the emotions felt by the people, who interact with you. It is the ability to simultaneously recognize immense volumes of data, which grants the mind its massive competence in behavior pattern recognition. Combinatorial matrices can remember a virtual infinity of combinations. So, cubic miles of memories are required to record, recognize and recall events. At the highest level, a single matrix will perceive, recognize, judge and act on the global information available to the system. The prefrontal regions of the brain could be such a matrix. Memory storage on the required scale is a huge problem. But, if Moore's Law solves this problem, computers, could achieve true behavior pattern recognition. They could possess far larger matrices and be genuinely more intelligent than humans.